"This pork chop is so good you'll say it tastes like heaven!" Heat oil in a large skillet over medium-high heat. Combine flour, seasoning salt, salt and pepper in a paper or plastic bag. Place pork chops into the bag, and shake to coat. When the oil is nice and hot, shake off excess flour from pork chops, and fry in the hot oil. Cook on each side for about 4 to 5 minutes, or until golden on the outside, and juices run clear. 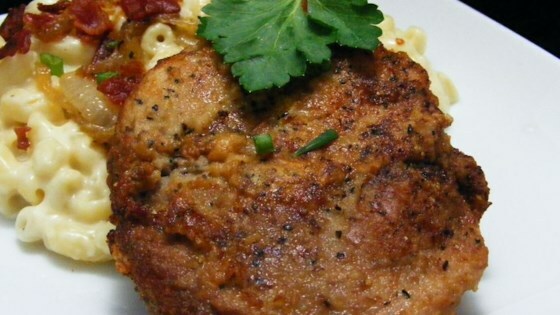 Really awesom pork chops. I used half butter half olive oil. Very flavorful and tender.